Lion Fire Update, 10/5/17, 3pm: 7,850 Acres, Burning to the North. Ponderosa circled in yellow to the south. The Lion Fire, ignited by lightning on September 24, has grown to approximately 7,850 acres. The fire is burning northward from Lion Meadow within the Golden Trout Wilderness in the Sequoia National Forest. Most of the fire’s spread has been through areas previously burned in the 2011 Lion Fire and 2006 Tamarack Fire. Firefighters are conducting firing operations along the ground and using a Plastic Sphere Dispenser from a helicopter to strategically keep the fire from spreading beyond identified containment lines. These efforts will reduce the threat of fire to property and natural resources in and near the wilderness. “Most importantly, this suppression tactic keeps the firefighters safe from standing dead trees (snags) from previous fires and drought caused tree mortality,” stated Incident Commander Jack Medina. Crews are implementing structure protection by constructing fireline and firing out ground fuels around the structures. They continue to utilize Minimum Impact Suppression Tactics (MIST) to maintain the natural character of the wilderness. Efforts to contain the fire will be made along routes where firefighters can work safely while avoiding stands of dead trees and inaccessible terrain. Nearby communities should anticipate smoke settling into the valleys and canyons in the late evening and early morning hours because inversion patterns normally hold the smoke in low-lying areas. Daily smoke forecasts are available. Smoke from the Lion Fire will be transported by West winds into communities along the Eastern Sierra throughout the day. Diurnal winds will continue to bring smoke into Kernville in the evening and morning. These conditions will continue today. East winds tomorrow may bring smoke into the San Joaquin Valley. The Pier Fire will continue to produce small amounts of smoke and haze as interior areas of the fire finish burning. Continue defensive firing in front of fire establishing in unfavorable areas to ensure firefighter safety. 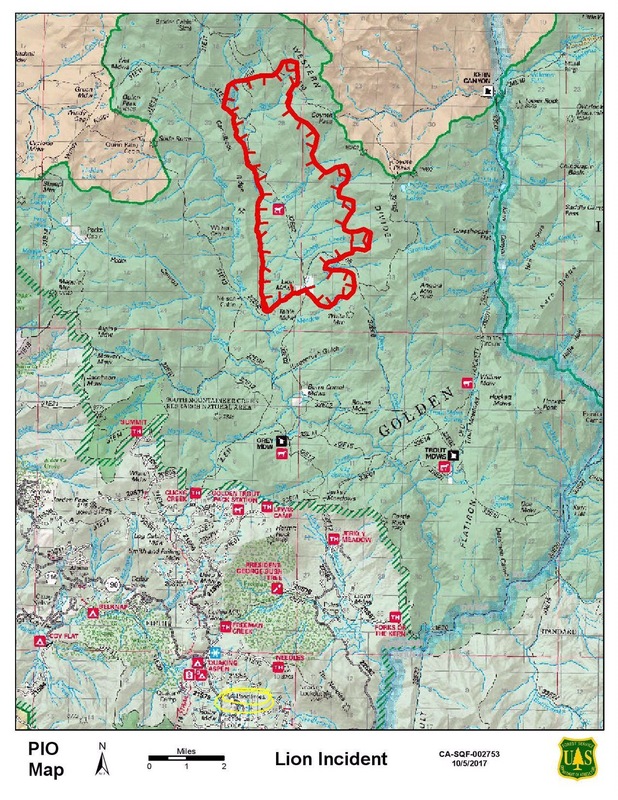 Forest Closure Order will soon be closing trails in the Golden Trout Wilderness north of Grey Meadow, west of Trout Meadow, and east of Nelson Cabin. A warming and drying trend will occur over the fire area the next few days as a low pressure system in the great basin slowly exits the area. Thursday expected max temps 62-67 and humidity 18-23%, southwest winds 1-3 mph until 1000 then southwest 2-5 mph. Ridgetop winds northwest 1-4 mph in the morning shifting to southwest by noon. This entry was posted in fire, ponderosa and tagged cal fire, california fire, fire, golden trout wilderness, golden Trout Wilderness pack station, lion fire, ponderosa, wild land fire. Bookmark the permalink.